Tom Brady is a four-time Super Bowl winner with New England. 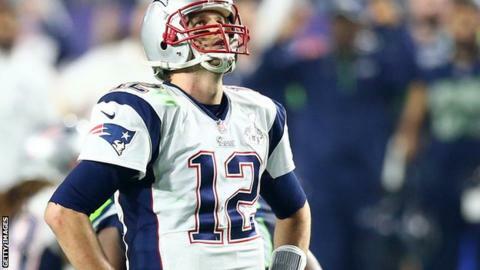 Tom Brady's agent says a report that claims the New England Patriots star knew of a scheme to under-inflate balls in an NFL game contains "tragic flaws". Don Yee says the Wells Report, which was commissioned by the NFL, omitted key facts. Yee accused the NFL of a "sting" operation and said the report "omitted nearly all" of Brady's testimony. He added: "The Wells Report, with all due respect, is a significant and terrible disappointment. "Its omission of key facts and lines of inquiry suggest the investigators reached a conclusion first, and then determined so-called facts later." Both the NFL and Wells' law firm were not immediately available to respond to Yee's claims when contacted by BBC Sport. The NFL was investigating claims the Patriots had deflated match balls to give themselves an advantage over the Indianapolis Colts. Eleven of the 12 game balls they provided for the rain-affected match were under-inflated by about two pounds per square inch, consequently giving Brady more grip in the cold and wet conditions. The 243-page report, compiled by NFL executive vice-president Jeff Pash and lawyer Ted Wells, expresses the opinion that it was "more probable than not" the Patriots deliberately used balls which were below regulation pressure limits in January's play-off win over the Colts. The Patriots subsequently went on to win the Super Bowl in February. The report said Patriots quarterback Brady, 37, was "at least generally aware of inappropriate activities" allegedly carried out by locker room attendant Jim McNally and equipment assistant John Jastremski. The report notes the Colts notified the NFL before the game that they suspected the Patriots might be deflating game balls, a revelation seized upon by Yee. "One item alone taints this entire report," he said. "What does it say about the league office's protocols and ethics when it allows one team to tip it off to an issue prior to a championship game, and no league officials or game officials notified the Patriots of the same issue prior to the game? "This suggests it may be more probable than not that the league cooperated with the Colts in perpetrating a sting operation. "The Wells report buries this issue in a footnote on page 46 without any further elaboration." "This was Framegate right from the beginning. They're saying he's possibly aware. How do you put a cloud over somebody like this? In this country, you're innocent until proven guilty. It just seems Tommy is now guilty until proven innocent." Yee went on to claim it "was not an independent investigation and the contents of the report bear that out. "The investigators' assumptions and inferences are easily debunked or subject to multiple interpretations." In a statement released following the publication of the Wells Report on Wednesday, NFL Commissioner Roger Goodell praised "Ted Wells and his colleagues for performing a thorough and independent investigation". Expanding on his assertion that the report contained little of Brady's testimony, Yee said: "I was physically present for my client's interview. I have verbatim notes of the interview. "Tom made himself available for nearly an entire day and patiently answered every question. "For reasons unknown, the Wells report omitted nearly all of Tom's testimony, most of which was critical because it would have provided this report with the context that it lacks." Brady - a four-time Super Bowl winner and three-time Super Bowl MVP with New England - has previously denied any knowledge of ball tampering.